Superkick Party is about a super talented tag team named The Young Bucks, a tag team popular in the independent wrestling scene and part of the Bullet Club faction. As of this writing, they currently hold the IWGP Junior Heavyweight Tag Team Championship for the fifth time in New Japan Pro Wrestling. They’re also the currently reigning Ring of Honor Tag Team Champions on their second reign. They also have a cool finishing move which is a springboard-assisted spike tombstone piledriver called “The Meltzer Driver”. Anyway, wrestling talk aside, you play as both the Young Bucks taking charge of their merchandise table as a legion of fans buy shirts. The goal of the game is to get as much money from your loving fans no matter what. What’s stopping you is the legions of masked rivals who’ll want to take your merch out of the picture if you don’t use your powerful superkicks to stop them. Simple premise. What is a superkick you ask? I never even saw this game in the front page of the Google Play Store when it was released, oddly. I only heard about it after reading some wrestling news at work several weeks ago. It’s not every day where you see wrestlers get their own games, especially rarer to find out that it’s a game based on wrestlers not from WWE. It’s a simple game, really. 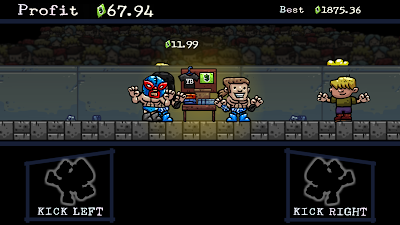 It’s surprisingly fun and it does get tense when fans and luchadors rush in huge lines that you really do have to utilize your superkicks and time them precisely. otherwise you hit a fan which is a good way to lose revenue. 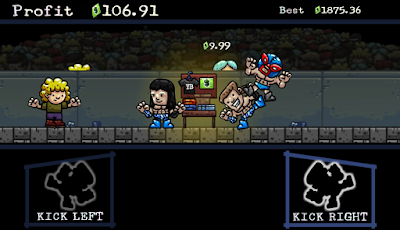 When this barrage of luchadors rush in and you have to accurately press the kick buttons, it’s always fun to shout “Superkick Party!” if the hype takes you over. 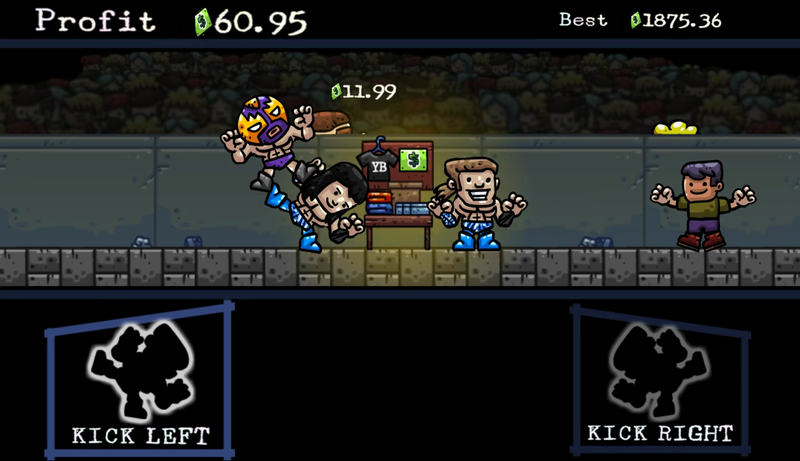 Do I recommend Superkick Party though? Yes, but only as a time waster with no microtransactions whatsoever. Don’t expect anything else other than superkicks. 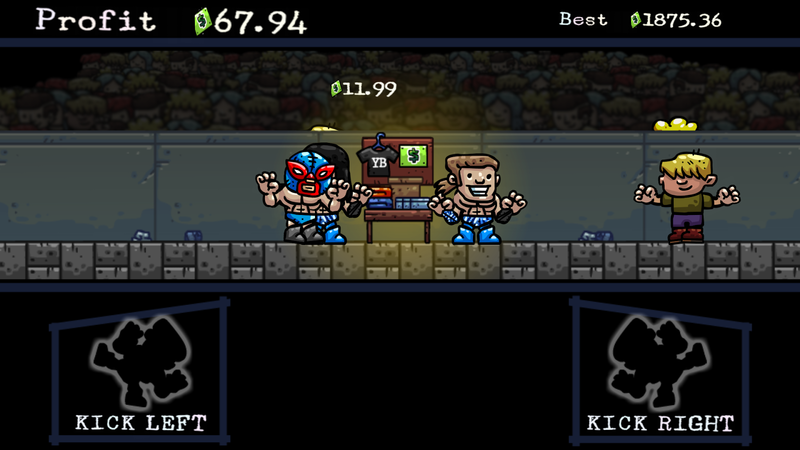 It’s all about superkicks and using them to take out your luchador rivals. It essentially feels like a Young Bucks match. I would recommend it for people who like kicking other people in the face as I’m betting that’s a huge growing market. The game does get tiring and repetitive if you spend more than five minutes playing it but that’s the point. It’s not supposed to be a super long RPG, as bloody awesome as The Young Bucks superkicking annoying blondie Cloud Strife. It’s a game to pass the time when you’re in the bus on the way to work or when you’re busy ignoring your family because they’re talking about entertainment stuff and you don’t really care, unless The Bucks give superkicks to the Kardashians or at least the idiots reporting their every move. The music does get repetitive after five minutes so perhaps mute the game and listen to your own music library from an external app. The only feature I’d like is to have unlockables. Unlockables in mobile games or games in general using in-game currency give you a reason to keep on playing. It’s not easy motivation but it’s something to look forward to. Fun unlockables would perhaps be alternate outfits, different background music, and maybe other Bullet Club members like Kenny Omega, Adam Cole, and Bad Luck Fale. Perhaps different background locations such as malls, parking lots, and convention centers instead of this seedy, barely lit arena. 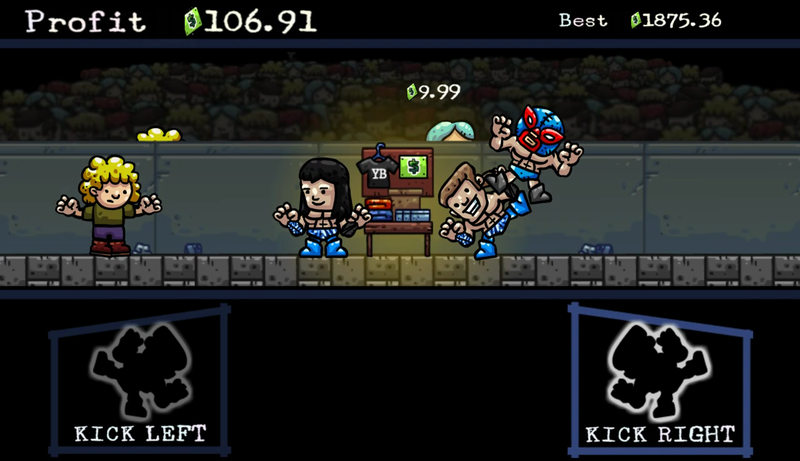 Granted, paying 2 dollars for what is basically just 30 seconds of gameplay because it features indie superstars The Young Bucks and their infinite amount of superkicks doesn’t seem like a good way to spend two dollars on. My personal suggestion would be to download Google Opinion Rewards on Android and just earn two dollars from answering surveys after a couple of weeks. That way, you technically didn’t have to spend money on the game and you still bought a game about these super cool dudes. 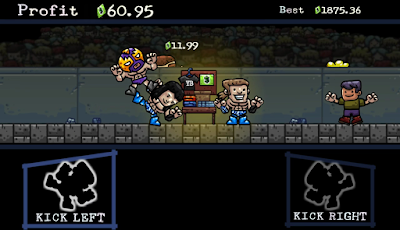 “Superkick Party” by Suplex Industries is available on the Google Play Store and the Apple App Store for US$1.99 or CA$2.61.